For a the last few seasons, CBS has been showing a TV show called Numb3rs. The show's premise is the unimaginitive take off on the family-solving-mysteries storyline that has been around since Scooby Doo and at the earliest the Hardy Boys. Of course, Numbers has some thngs that are different – the boys are employed and older. Don Eppes,the older brother, heads a team of federal agents located in LA – a giant step above the amateur detective ways of the Hardy boys. 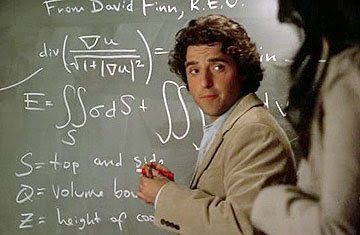 Charlie Eppes is a certified math genius and teaches as a professor at the made-up university of Cal Sci. Each week, Don and his street-savvy FBI team encounter a problem, usually a time sensitive one, which is just too tough to figure out through traditional police work. Like clockwork, Professor Charlie Eppes and his team of socially-awkward yet brilliant mathematicians are able to use some form of advanced mathematics to accomplish a whole list of things from predicting where a kidnapping will happen next to the contents of boxes. And while a great deal of that is Hollywood magic, taking lab theory and shoehorning it into unrealistic time periods with even less realistic amounts of data, there is one part of the show that I always admire. During the hour-long show, the young Professor Eppes must give an explanation to a complex, doctoral-level mathematical system in a way that a team of federal agents can understand. This happens every single episode with such predictability that the character in the show have started to expect it, even making jokes and attempting to give their own explanations. Charlie’s explanations are definitely a way to move the story forward and also to convince the television viewers that his genius mathematical insights aren’t simply a weekly deus ex machine. However, just as Charlie has to explain how his math models the real world, the use of software estimation can often seem just as improbable. True, you can sit back and say “Well, the program relies on parametric modeling of our current situation,” but that look is far more likely to generate blank stares than anything else. Article provided by Galorath, Cost Estimation Software Tools.